The In Your Classroom program helps students develop the habits of inquiry and skills of expression to competently apply literacy skills to media and technology. Catering to Utah public school students, these in-classroom interactive presentations are free of charge and can be booked at any time during the school year. This program is made possible by generous support from Professional Outreach Programs in the Schools (POPS), Art Works For Kids, and anonymous private donors. We take students on a journey of storytelling by going in-depth into the behind-the-scenes process of an animated film. A professional animator leads your students through the creative process with specific attention paid to storytelling elements, construction, impact of message, and the collaborative nature of this art form. Click here to check out our pre-event materials. This 50-minute interactive presentation is designed for 3rd – 12th graders. Based on your available room capacity, this presentation can be done for groups from a single class to a moderately-sized assembly. We bring the latest in Virtual Reality (VR) and Augmented Reality (AR) to your classroom to show how these immersive technologies can be used to create impactful stories. Students will learn the differences and similarities between traditional films and VR films, both from a filmmaking and an audience standpoint. 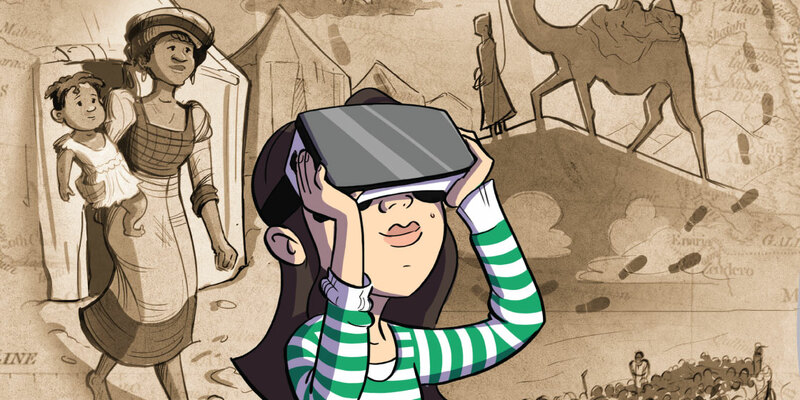 After watching a VR documentary filmed in a Syrian refugee camp, students will create AR content to delve into their own personal stories. This 50-minute interactive presentation is designed for a single class of 6th – 12th graders, that does not exceed 26 students. *This presentation uses Oculus Go headsets. Oculus recommends these headsets for ages 13+ due to the size of the headset and the spacing of the lenses. Real to Reel is a classroom presentation that explores various styles of documentary film. Students will learn to interpret intent, understand how filmmaking techniques affect our perception of the content, and apply criteria to demonstrate how these choices convey meaning to the audience. This 60-minute interactive presentation is designed for a single class of 4th – 6th graders, that does not exceed 36 students.